Finnish composer Magnus Lindberg is the 2009 recipient of the Teosto Prize, in recognition of his recent work GRAFFITI, for chamber choir and orchestra. Magnus Lindberg shares this award and the prize money of 40,000 euros with the Finnish pop band PMMP. 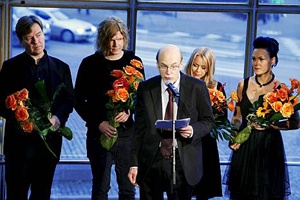 The decision by the finals' jury - chaired by journalist Pekka Gronow and further consisting of journalist Vesa Sirén, as well as rap artist and 2008 Teosto Prize winner Asa - was made public on Tuesday, 1 December 2009. The Teosto Prize is granted yearly by the Finnish Composers' Copyright Society Teosto. The award recognizes the boldness, originality, and innovativeness of a musical work and is not bound to any musical genre or style; accordingly the nominees and winners represent the variety of Finnish music from popular music to folk, jazz, as well as contemporary classical. Since 2003, the previous recipients have included Kimmo Hakola (2003), Jukka Tiensuu (2004) and Olli Kortekangas (2007). According to the prize jury, Magnus Lindberg revealed his masterful composer skills by having a symphony orchestra and a chamber choir perform in GRAFFITI like a perfect match. The carefully chosen Latin fragments from ancient Pompeii graffiti inscriptions form a fresco of the society of 2000 years ago and of today; since ancient times, graffiti has been used as a tool for free expression of social or political criticism. GRAFFITI also contains references to Igor Stravinsky's Oedipus Rex, as well as to the music of Bartók and Puccini. However, GRAFFITI carries the individual sound of Magnus Lindberg, who has always been recognized as a great master of the orchestral sound, and who now has proves to be a master of choral music. GRAFFITI was completed in spring 2009 and premiered on 20 May 2009 by the Helsinki Chamber Choir and the Finnish Radio Symphony Orchestra under Sakari Oramo, to great critical acclaim. The studio recording, made three days later at the Finlandia Hall and featuring the same performers, will be released by Ondine internationally in February/March 2010 (ODE 1157-2). For more information, in Finnish, visit the website of Teosto.